The FileMaker WebDirect user experience is intended to be as similar to the FileMaker Pro desktop experience as possible. One of the core functions on the desktop is the ability for user to Print layouts, but that has been a challenge for users on web browsers. Now in FileMaker 16, the fidelity between the browser experience and the desktop is better than ever before, due to the addition of PDF support in FileMaker WebDirect. For example, you can now program your FileMaker apps to allow users to Print PDFs of invoices, labels, badges, and more while accessing your app in FileMaker WebDirect. In addition, FileMaker Server 16 now provides support for the “Save Records as PDF” script step. 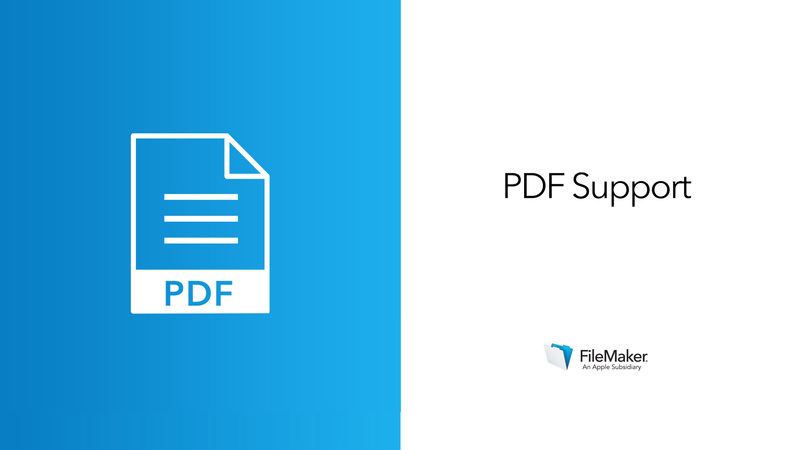 This support allows you to run automated reports and save other information as PDFs, using scripts performed on FileMaker Server. One script, any platform: The Print and Save Records as PDF script steps are now supported on Desktop in FileMaker Pro, FileMaker Server, FileMaker Go or in a browser via FileMaker WebDirect. Let the app email important information: A common request is to schedule a regular email to key decision-makers including data from your app, or to email invoices to clients. Now that you can generate a PDF on the server, you can schedule a weekly server-side script to create a PDF of a report or set of invoices and distribute the information via email — without a user having to lift a finger. See how to print in FileMaker WebDirect without having to change your script, and attach PDFs to emails generated by a scheduled server-side script.